I promised some glitter swatches and if I do say so myself, I think I delivered. To be fair, Lush Lacquer actually delivered. This little Etsy store has been around for a while, and is an old favorite on my list of indie sellers. I always love the polishes this mother-daughter team puts out, and they've always been excellent about actually keeping a very full stock of their colors. Over 6,000 sales and 100% positive feedback? Damn. They have worked hard to create beautiful mixes of glitters which range in some great varieties. I have three to show you today. I have great things to say about all of them. Across the board, these glitters are both manageable and plentiful. The bases were not too thick to apply the glitter, but there wasn't a shortage of glitter on the brush either. I'm very pleased with that, especially considering these bottles were minis. Getting a mini bottle's brush to cooperate is probably comparable to getting an unwieldy cat into a carrying crate, but these were fine, purring happily with each stroke. 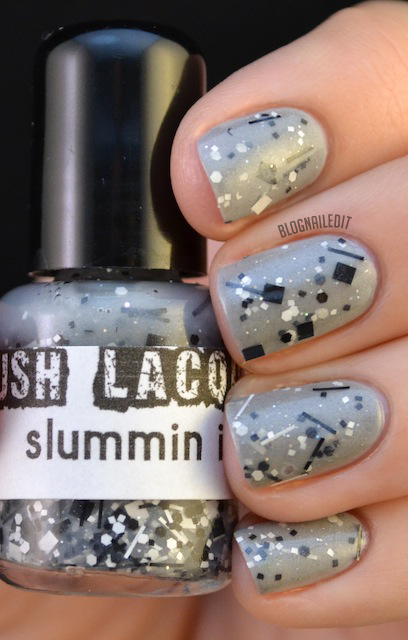 First up is Slummin' It, shown here over Pelican Grey (China Glaze). There's the faintest amount of shimmer in the base, so this isn't a clear base. I've layered it over this grey, which changed the color every so slightly. Over white, this would be more obvious. I used three layers, with some dabbing in between. 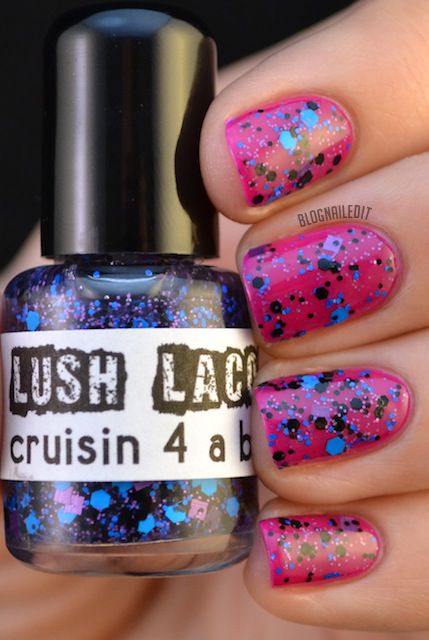 Next is Cruisin' 4 a Bruisin' over Under the Boardwalk (China Glaze). This pairing was made under poor light conditions that tricked my eyes into thinking this was a neon purple base, but it worked out well. You can see all the different colors, including the purple pieces of Cruisin' 4 A Bruisin' with it. Finally, the most Fall-appropriate color, Afterall It's Fall. I paired this with a brown-red instead of a rich red. If I hadn't these colors could have easily morphed into Christmas colors. Afterall is versatile in that way. It's obviously fall-themed with the right colors too. The right acorn leaf pattern also helps. 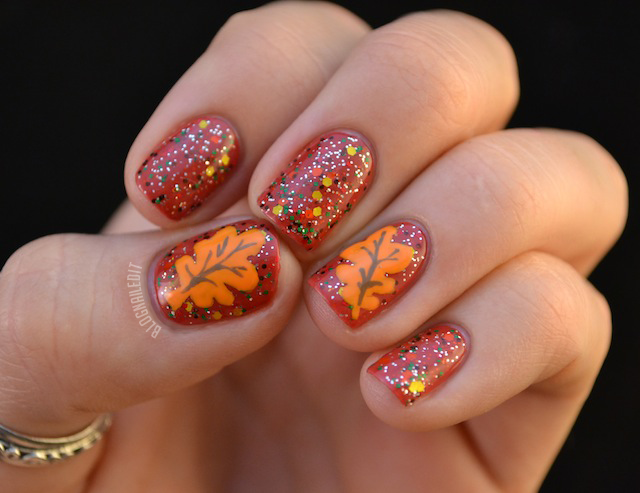 I used Papaya Punch (China Glaze) and A-Taupe the Space Needle (OPI) for these fall leaves. 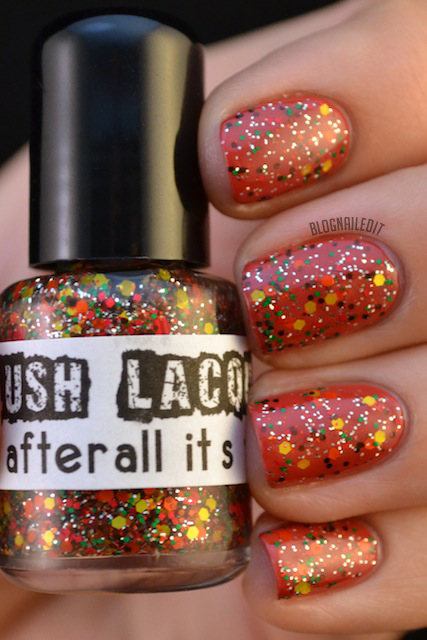 So I've fallen for Lush Lacquer, and glancing at the store now shows that there are some Halloween colors currently up for grabs! I personally recommend purchasing from these ladies and think you'll be quite happy with your purchases. These products were sent to me by Lush Lacquer. The reviews are based entirely on my experience with the products and were in no way influenced by anyone. I've been wanting to try some Lush Lacquer for a while now, but I can get myself to spend the extra money. They do have very very beautiful selections of polish. One day.....one..day. Lovely collection this! Damn, my pocket is going to regret viewing this post. These are gorgeous, I love the fall design. What great polishes! I love your fall mani! I love your fall mani! So perfect for the season. Lush Lacquer is my absolute favorite indie polish at the moment...like you said, the consistency and amount of glitter you get for not a lot of work is excellent!